I liked this book for several reasons. It’s a brash blend of sci-fi and dystopian, it brings something unique to the YA table, and in a sea of duologies, trilogies, and more, it’s a standalone. The world-building is fantastic and Nemesis has an intriguing character arc. Nemesis on page one is a completely different character from what she becomes at the end, and seeing her discover there’s more to her than protecting and killing is interesting – but realizing she can’t unlearn some of those instincts made her story more complex. But for me, Tyrus is easily the most compelling character and full of surprises and although this is told from Nemesis’s POV, I would have loved to spend some time in Tyrus’s head. With so much going on – political maneuvering, backstabbing, romance, action, and several twists, I could have finished this book in a couple of days if real life hadn’t intruded. Yes – this is a standalone; however, this series could easily continue and I wouldn’t mind seeing where it goes from here. 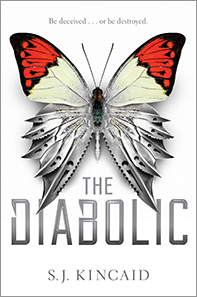 The Diabolic is scheduled for publication November 1, 2016. Thanks to Edelweiss and the publisher for an ARC in exchange for an honest review. I’m adding this to my TBR list for sure. Definitely worthy of the TBR list. I definitely did – something a little different. Thanks for this great review, Teri. I’m tired of violence generally and might have turned away from this one. But your description makes me want to check it out. Hugs. Thanks, Teagan! This definitely had some violence, but it wasn’t gratuitous – it went along with the storyline. Hope you’ll look into it!